Hmm…well I can’t exactly call this episode an “ending” since it’s just a wrap-up, but it makes for a decent epilogue (as advertised). I think it’s safe to say that this epilogue was mostly fan service like the prologue (I was definitely surprised that there was a fight scene though). We mostly get to see adult Rin in action. Content-wise, I’d say I’m a bit skeptical of Shirou’s ending because it seems like he’s still going down the same path as Archer and theoretically doomed to repeat it. So in all, this series was a noticeable improvement on its predecessor and pretty enjoyable to watch. I think I’m going to start recommending that people just ignore the original Fate/stay Night. I think this series might be one of my favorites of the season…and I knew most of what would happen in it going in. So…yeah, that’s this season in a nutshell. And so the battle is over. As expected, Archer didn’t die quite so easily and shows up in the end to save both Rin and Shirou. Gilgamesh seemed to die in the silliest way this week too…he says something about being reluctant to use Ea because he doesn’t want the unworthy to lay eyes on it, but Shirou had already seen it (and failed to copy it). So what exactly was the problem with using it in the Unlimited Blade Works sooner? Anyway, it looks like next week’s episode will end up being an epilogue. I didn’t even realize there was enough epilogue content for a full episode, so I didn’t even consider that possibility. I was expecting this week’s episode to hang one of the battles to resolve next week. What exactly is supposed to happen next week? Rin and Shirou going to get married or something? That suspicion I had last week about Rin and Saber’s secret talk was somewhat anticlimactic…they ended up revealing it pretty quickly that they were actually talking about the fact that Saber would have to fight without much help from Rin’s mana. Other than that, there were some fun battles to watch this week. 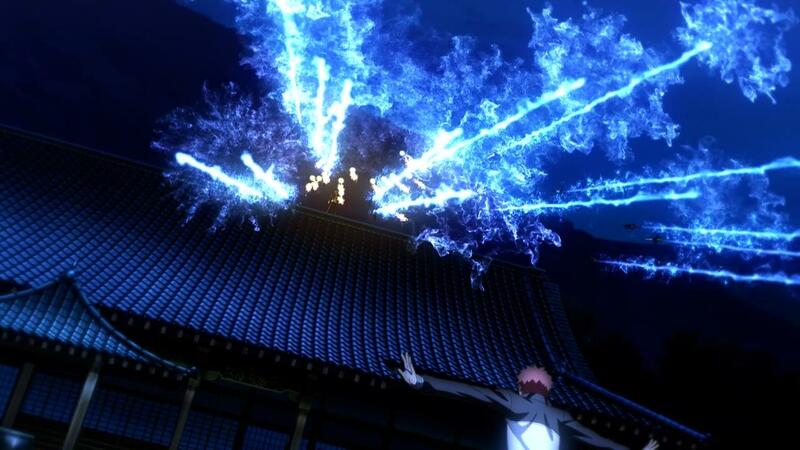 I’m a bit annoyed that Shirou spent most of the beginning of his fight trying to fight with projections as normal, though. I would have figured he would realize that doesn’t work by now. But that aside, we got some fun fireworks between the two, right? 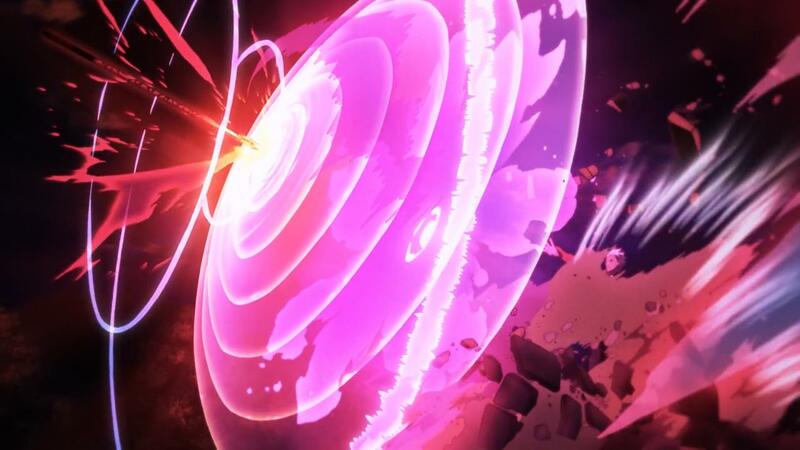 So this week’s episode is a simple preparation for the upcoming final battle…not too much going on. 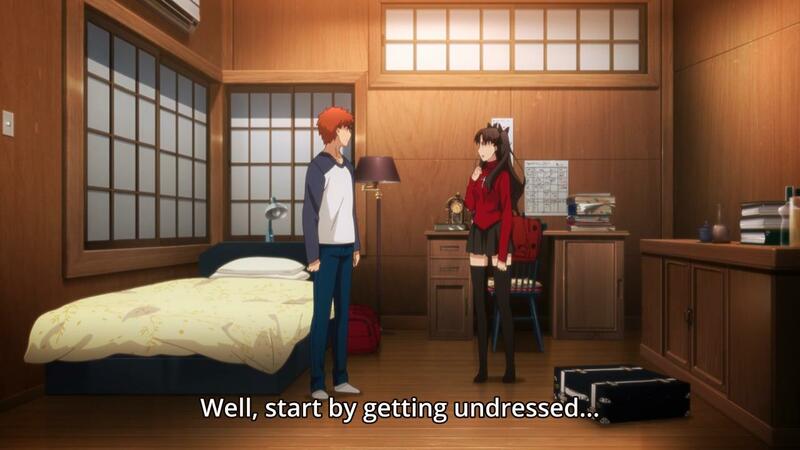 I realize I have somewhat of an obligation to discuss what really happened in that room between Rin and Shirou, so I’ll just get that out of the way. <insert R-rated discussion here> With all of that discussion aside, the only other thing to discuss is Saber’s clandestine discussion with Rin. I realize the simple explanation is that they were just coming up with the idea to share Rin’s magic with Shirou, but I feel like there wouldn’t be a need to hide the discussion from the audience in that case…so there’s probably some other dimension to the fight that they don’t want him to know. As for next week’s episode, the preview mentions a character that shouldn’t be around because Caster is dead, which can only mean Assassin. If so, I would also be curious as to why he’s still around without his Master. Besides that, the preview makes it sound like the battle between Gilgamesh and Shirou will start as well. That should be an interesting fight, especially if Shirou really is able to pull off Unlimited Blade Works. So Gilgamesh is going to be the one completing the Grail after all. I’m sure most people are happy to see Shinji as the vessel (I can’t say I disagree with them). Gilgamesh also reveals that the Grail War is a way to trick the Servants into fighting each other to fill the Grail with their souls. On the Archer side, is it wrong of me to be suspicious about his death this week? I just have this feeling that he wouldn’t leave the series so easily. Given that there are still four episodes remaining, I’m going to guess that next week’s episode will be a fairly slow preparation episode for the final fight. There doesn’t seem to be anything heated going on in the preview either. There are only so many characters still alive in this series, so I’m curious how they’re planning on spending the rest of the time. Fate/stay Night Unlimited Blade Works S2 Episode 20: Being Lancer is not suffering? Wait, so the battle between Shirou and Archer still isn’t over? It looks like Avalon, which was very relevant in the first adaptation of Fate/stay Night is becoming relevant in this series too. That sort of convenient plot armor was really annoying in the original series, though, so I’m not sure I like seeing it in this series too. That being said, I think we can all agree that the main story of this week’s episode was Lancer. Though I question a Command Seal that doesn’t have full effect (if Lancer didn’t have to kill himself immediately, why couldn’t have just pulled out a cigarette or something?…technically counts as killing yourself), I can probably let it slide just because of the cool stuff Lancer got to do. So how do things play out now that Kirei is dead? He seemed to be the only one with a legitimate plan to make the Grail appear…does Gilgamesh now just take his place? Or worse yet, does Shinji do it (getting tired of that guy)? That aside, theoretically next week’s episode resolves the fight between Shirou and Archer. Let’s see how it goes. Author marthaurionPosted on May 24, 2015 Categories Fate/stay Night UBWTags fate, saber5 Comments on Fate/stay Night Unlimited Blade Works S2 Episode 20: Being Lancer is not suffering? I suppose this week’s episode is somewhat of a more “official” reveal that Archer is actually Shirou, but I think it’s been pretty obvious before now. I really didn’t expect them to devote an entire episode to Archer’s past and exposing why he wishes to kill Shirou. I’m mostly curious about how long Archer was a Guardian before he was killed. I can somewhat understand this idea that constantly witnessing suffering eventually erodes even the strongest ideals, so I think it’s really naive for Shirou to say that he will never think like Archer (almost painfully so). On the other side of the spectrum, it is finally revealed that Kirei, despite being the arbiter of the Grail War, is another Master and that his plan is to use Rin as the Holy Grail. I’m not too familiar with the Fate world, but I’ve only seen homonculi being used to summon the Grail, so I’m curious how Rin qualifies. That aside, hopefully next week will finish the battle between Archer and Shirou…was waiting for that this week. Fate/stay Night Unlimited Blade Works S2 Episode 18: Does this count as the big reveal? So it’s finally revealed that Archer is Shirou’s future self, driven mad by the betrayal of others he tried to help by sacrificing his own humanity. It’s never said in words, but heavily implied, so I’m just going to run with it. I’m still trying to wrap my head around the battle between Shirou and Archer in the Unlimited Blade Works, though. Did it just skip a scene? Were the production costs of just showing the UBW too high? I’m also similarly bothered by the fact that Rin was able to become a Master again so easily…if all you need is a Servant willing to accept you to refresh your Command Seals, that seems far to easy to exploit. Anyway, is next week’s episode not the battle between Archer and Shirou? The preview seems to feature Lancer. Also, the last scene in the episode reminds me…what exactly happened to Assassin when Caster died? Author marthaurionPosted on May 10, 2015 Categories Fate/stay Night UBWTags archer, fate, saber2 Comments on Fate/stay Night Unlimited Blade Works S2 Episode 18: Does this count as the big reveal? Quite a lot of stuff happening in this week’s episode. I’m quite surprised that with three battles happening at the same time, they decided to end them all in one episode. I would have honestly expected them to have been dragged out. I’m not sure what the general opinion will be for how the main battles were presented (first showing Shirou’s side, stopping at a critical moment when Caster’s blood is spilled, then reversing time and showing from Rin’s perspective), but I wasn’t honestly a huge fan. I know that battles like these tend to happen at the same time, but I don’t see any reason why the audience needs to be made aware of that fact. Only a minor criticism of the episode, though. I’m so upset that the battle between Archer and Lancer started at the end of this week’s episode. Anyway, this week’s episode also brings up an interesting discussion about Shirou’s general mentality. Naturally, I’m inclined to side with Rin just because I’ve never been a believer of true altruism. I’ve always thought that most selfless actions are done with a selfish intent. Shirou’s attitude just rubs me the wrong way…it’s almost ironic that his stubborn beliefs about helping others step all over Rin’s wishes for him. Next week should be the battle between Archer and Lancer (round 2). Given Lancer’s track record in all Fate series, the fight probably doesn’t end up going too well for him…though it’s probably too early in the second half to kill off a Servant (plus his Master hasn’t been revealed yet). I’m also curious whether they’ll explore Archer’s identity some more. I already know, but this week there was definitely a clue with Rin’s comment about the heart pendant. Author marthaurionPosted on April 26, 2015 Categories Fate/stay Night UBWTags fate, grail, saber2 Comments on Fate/stay Night Unlimited Blade Works S2 Episode 16: Finally an ally?